© 2017 Muthyala, T. This is an Open access article distributed under the terms of Creative Commons Attribution 4.0 International License. Introduction: The rupture of an intracranial Arteriovenous Malformation (AVM) in pregnancy is a rare occurrence, but may have fatal maternal and fetal consequences. Association between AVM rupture and pregnancy has been proposed which may be caused by increased cardiac output or circulatory effects of the elevated estrogen levels. The presentation during the pregnancy is usually as a result of Intracerebral Haemorrhage (ICH) following their rupture. Prognosis depends on the site, size, angio-architecture of AVM and extent of bleed. The risk of rebleed in an untreated symptomatic AVM is increased and mortality rate associated with the second bleed is 13% with the rate increasing to 20% for each subsequent haemorrhage. Till date, only a few reports have been published with a rebleed in cerebral AVM in pregnancy. Case report: We report a case of a 29 year old female who presented with ICH following ruptured occipital AVM in both her pregnancies. She was managed conservatively in her pregnancy followed by Gamma knife surgery in the postpartum period. Despite a rebleed in AVM, she had good maternal and fetal outcomes. 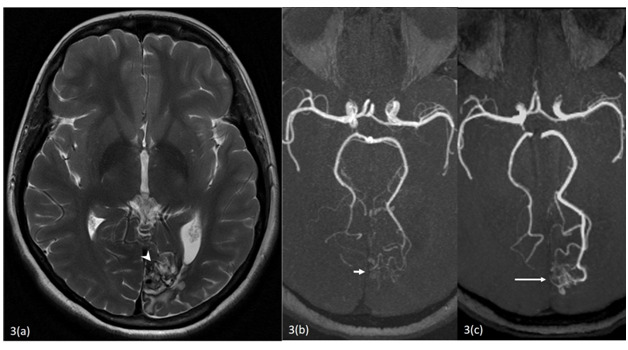 Intracranial Arteriovenous Malformations are formed from a vascular plexus of direct arterio-venous connections that lack an intervening capillary bed. During pregnancy AVMs usually present with intra cerebral haemorrhage (ICH), headache, seizures or focal neurological deficit. Elevated cardiac output, blood pressure and blood volume may predispose pregnant patients with AVMs to intracranial haemorrhage. The management plan needs to be individualised for each patient. Surgical intervention for ruptured AVM during pregnancy could prevent re-bleed however there is a risk of complications related to the pregnancy, possibility of preterm labour and intrauterine foetal demise. Literature suggests that radiation exposure to the developing foetus secondary to stereotactic radiosurgery and endovascular procedures are below the risk threshold. Nonetheless, these procedures should be performed during pregnancy only when medically necessary. Conservative management till term followed by a definitive treatment in the postpartum period is a viable option in these patients. Here we present a case of repeated rupture of an intracranial AVM in a pregnant patient during successive pregnancies. A 29 year old prime gravid presented to our hospital with severe headache with vomiting at 35 weeks of gestation. At the time of this admission her blood pressure was normal, fundus examination revealed papilloedema. Magnetic Resonance Imaging (MRI) revealed a left occipital lobe AVM with feeders from Posterior Communicating Artery (PCA) and an inter-hemispheric subdural haemorrhage. Neurosurgery consultation was sought. She was managed conservatively on anti-epileptics till term followed by an elective cesarean section under General Anesthesia (GA). Her postoperative period was uneventful. She was planned for intervention in the postpartum period but was lost to follow up. She presented again to neurosurgery emergency during her second pregnancy at 22 weeks of gestation with history of loss of consciousness for 4 hours. Her Glasgow coma scale was E3V5M6. She was a febrile with a pulse rate of 86 beats per minute. Her blood pressure was 110 systolic and 80 mm of Hg diastolic. Her neurological examination was normal except for right homonymous hemianopia. On obstetric examination, gravid uterus was relaxed and corresponding to 20 weeks period of gestation. MRI was performed which showed an abnormal bunch of vessels the left occipital region suggestive of an AVM nidus. A T1 isointense, T2 iso to hyperintense ICH was seen in the left occipital region, surrounding the nidus, abutting the occipital horn. The hemorrhage was also extending into the ventricular system via the left lateral ventricle (Figure 1). Her clinical and neurological status remained stable thereafter and as the patient was remote from term, she was managed conservatively. A noncontrast Computed Tomography of the head was performed one week later which revealed a resolving hematoma with no evidence of hydrocephalus. At the time of discharge, 10 days after ictus, her vitals were stable but homonymous hemianopia was persistent. She was explained about the risk of repeat hemorrhage and further neurological deterioration. Digital subtraction angiography (DSA) with embolization were planned in the postpartum period. She was again lost to follow-up despite counselling and subsequently reported to the antenatal clinic at 36 weeks period of gestation. She underwent elective repeat caesarean section under GA. Her peri-operative period was uneventful. DSA was performed after the caesarean section, which revealed a 1.7 x 1.3 x 1.2 centimetre occipital lobe AVM with feeders from left PCA. Prominent venous channels draining into the Superior Sagittal sinus and the straight sinus were seen (Figure 2). She was given option of gamma-knife radiosurgery versus embolization. The patient elected to undergo gamma knife surgery postoperatively. At follow-up visits, 2 and 6 months thereafter, she was doing well. Another MRI was performed 2 years after radiotherapy. This revealed resolution of the left occipital haematoma and reduction in the size of the nidus (Figure 3). Figure 1: 29 year old second gravida with left occipital AVM. (1a) Axial T2 weighted image shows multiple abnormal flow voids in the left occipital region (thick arrow). (1b) Axial susceptibility weighted image shows the adjacent hypointense intra parenchymal hemorrhage (arrowhead) with extension into bilateral lateral ventricles (thin arrow). Figure 2: Diagnostic DSA performed in the same patient. AP (2a) and Lateral (2b) images from the right vertebral artery run show an AVM nidus (arrowhead) with multiple feeders from the left Posterior cerebral artery (thin arrow) and venous drainage via a tortuous draining vein into the superior sagittal sinus (thick arrow). Figure 3: Follow up imaging 2 years after gamma knife. 3(a) Axial T2 weighted image shows resolution of the haematoma with post gamma knife changes in the left occipital lobe (Arrowhead). 3(b) MIP MRA image shows reduction in the size of the nidus (Small Arrow) as compared to the initial MRA shown in figure 3(c) (Long Arrow). The association between AVM rupture and pregnancy is controversial due to relatively low incidence of cerebral AVM. According to Liu et al the rate of ICH related to cerebrovascular malformations is similar in pregnant and non-pregnant women and that pregnancy does not increase the rate of first cerebral haemorrhage from an AVM. However, other authors have shown an increased risk of AVM rupture during pregnancy. There is a 2 - 3% annual risk of ICH with AVMs. ICH may be seen in 8% to 71% of patients with brain AVMs. The risk of rupture increases to 10 – 30 % in the first year after initial haemorrhage. The location, size, morphology, presence of associated aneurysms and drainage patterns of the lesion affects the risk of rupture. AVM treatment paradigms vary significantly, and are often individualized. Unruptured AVMs in pregnancy generally warrant conservative management due to the low risk of rupture. However, when they present with rupture, surgery needs to be considered either during pregnancy or in the postpartum period due to an increased risk of re-hemorrhage and associated mortality. The relative risks and benefits to the mother and her foetus must be carefully weighed. Endovascular embolization is widely accepted as an important component of contemporary, multimodal therapy for AVM. Although rarely curative, embolization can facilitate subsequent surgical resection or radio-surgery. In patients with high operative risk, inoperable lesions or those with stable neurological status, conservative management can be adopted during the pregnancy. Definitive therapy may be performed after delivery in such cases. Precautions are recommended during delivery and factors that influence the type of delivery include mode of management of the lesion (conservative versus operative) and maturity of the pregnancy at the time of ictus. Amias et al showed a bias in favour of caesarean section in 30 cases when neurological management was conservative. Caesarean section could be a better option as vaginal delivery could precipitate Valsalvamanauver thus precipitate rupture of AVM[2,3,5]. Close collaboration with a team of neurologists, neurosurgeons, obstetricians and anaesthesiologists is mandatory. Perquin DA et al in 1999 reported 3 women with intracranial AVMs. One of them carried two pregnancies after diagnosis. Caesarean sections were performed in both pregnancies which were uneventful. Another woman was 32 weeks pregnant when she presented with a haemorrhage due to a ruptured AVM. A she recovered well and was delivered by caesarean section. The third woman was 15 weeks pregnant when her symptoms occurred. There was a large intracerebral haematoma with rupture into the ventricular system. This patient expired later. 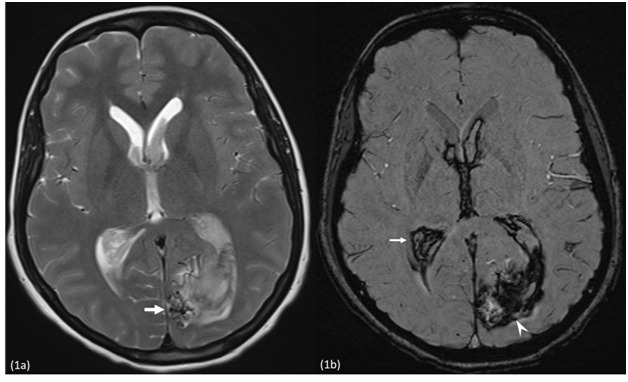 Nagamine N et al reported a 38-week-pregnant woman who developed an intracerebral hematoma secondary to a ruptured arteriovenous malformation. She underwent a caesarean section followed by craniotomy under general anaesthesia. The anaesthetic course was uneventful and resulted in good foetal and maternal outcome. Jermakowicz et al reported a 23-year-old woman who presented with headache and visual disturbance after the rupture of a left parieto-occipital arteriovenous malformation in the 22nd week of her pregnancy. After taking precautions to shield the foetus from radiation, endovascular embolization followed by open surgical resection of AVM were performed. Three important issues have emerged from this case for clinical implication firstly the chances of Haemorrhage due to Cerebral AVM is increased in pregnancy. Conservative approach should be the first line of care in pregnancy if the patient is stable. Caesarean section should be the mode of delivery in this case. Gamma knife surgery should preferably be avoided in pregnancy. Management of cerebral AVM in pregnancy is complex and needs to be individualized considering obstetric and neurological status. Treatment options are similar to that of a nongravid uterus and ruptured AVM require definitive treatment due to high risk of rebleed and associated fatal consequences. However conservative management during pregnancy even after bleeding may be an option if patient remain stable. Though potentially safe levels of fetal radiation exposure may be achieved during endovascular and SRS procedures in pregnancy, no radiation exposure should be considered unless medically necessary. Mode of delivery should be by caesarean section. Multidisciplinary team management involving neurologists, neurosurgeons, obstetricians, ophthalmologists’, intervention radiologists and anaesthesiologists in a tertiary centre is mandatory to facilitate good outcome in such high risk pregnancies. 1. Ajiboye, N., Chalouhi, N., Starke, R., et al. 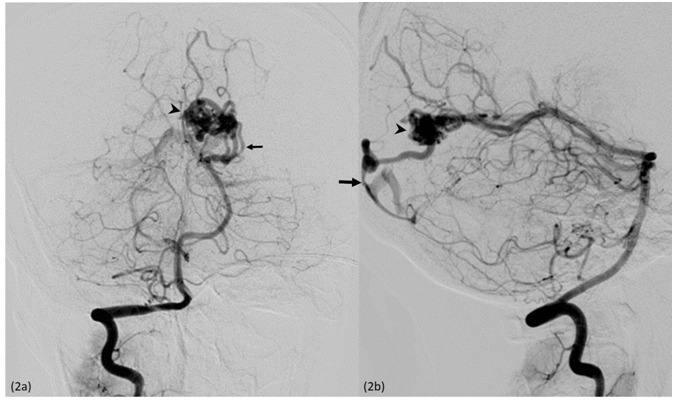 Cerebral Arteriovenous Malformations: Evaluation and Management. (2014) Scientific World J 6. 2. Horton, J.C., Chambers, W.A., Lysons, S.L., et al. Pregnancy and the risk of hemorrhage from cerebral arteriovenous malformations. (1990) Neurosurgery 27(6): 867-871. 3. Lv, X., Liu, P., Li, Y. The clinical characteristics and treatment of cerebral AVM in pregnancy. (2015) Neuroradiol J 28(3): 234-237. 4. He, S., Mack, J.W. Considering Radiation Exposure during Diagnostic and Therapeutic Procedures for Arteriovenous Malformations in the Setting of Pregnancy. (2014) World Neurosurg 81(1): 22-24. 5. Liu, X.J., Wang, S., Zhao, Y.L., et al. Risk of cerebral arteriovenous malformation rupture during pregnancy and puerperium. (2014) Neurology 82(20): 1798–1803. 6. Jermakowicz, W.J., Tomycz, L.D., Ghiassi, M., et al. Use of endovascular embolization to treat a ruptured arteriovenous malformation in a pregnant woman: a case report. (2012) J Med Case Reports 6: 113. 7. Amias., A.G. Cerebral vascular dliseases in pregnancy I. Hemorrhage. (1970) J Obstet Gynaecol Br Commonw 77(2): 100-120. 8. Perquin, D.A, Kloet, A., Tans, J.T., et al. Intracranial arteriovenous malformations in pregnant women. (1999) Ned Tijdschr Geneeskd 143(10): 497-500. 9. Nagamine, N., Shintani, N., Furuya, A., et al. Anaesthetic managements for emergency cesarean section and craniotomy in patients with intracranial hemorrhage due to ruptured cerebral aneurysm and arteriovenous malformation. (2007) Masui 56(9): 1081-1084.